Make sure you enforce double barcoding detection (i.e. barcode on both sides). Unbalanced adaptor and sequence molarity can generate a lot of single barcoded products that can get joined with unligated barcodes and other reads in silicon to make chimeras. Use porechop —require-two-barcodes to sort this out. Before nanopolish, align the demultiplexed reads to the reference genome. I would suggest minimap2 -ax map-ont or bwa mem -x ont2d, they both work fine. To do reference-based nanopolish you need to run it in nanopolish variants mode. The –consensus mode is just for de novo applications not for reference based stuff. 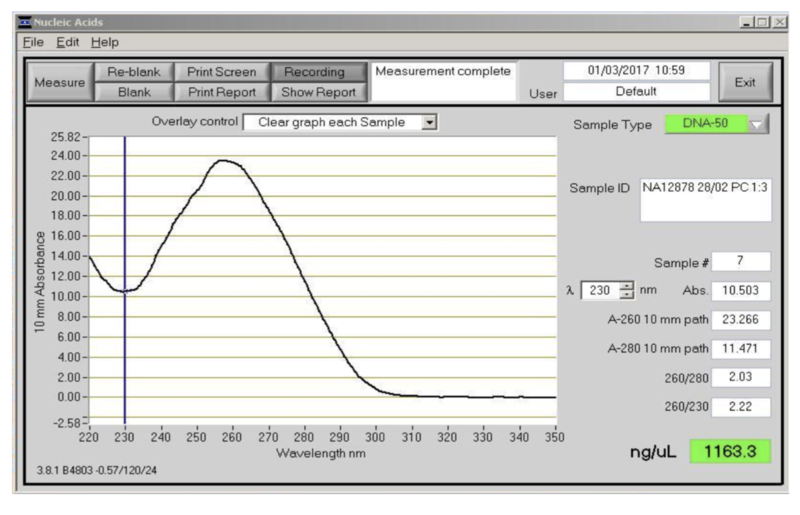 It is absolutely vital that the reads you supply to nanopolish are the same reads that you used to make the alignment (i.e. the demultiplexed, trimmed ones, for example). Any mismatch here will have weird consequences and will not give sensible output. 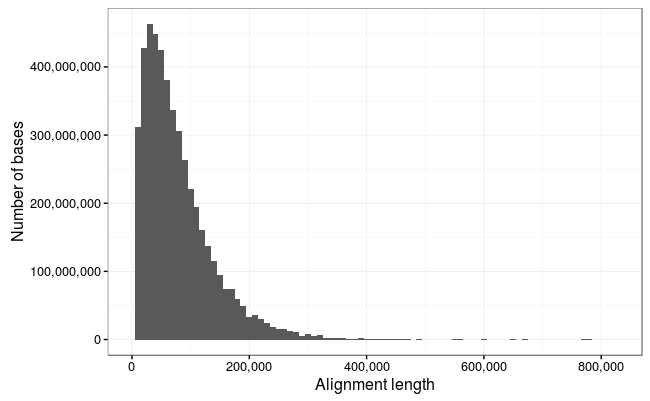 If your reference is highly diverged, increase value of -x (I use 1,000,000) to consider more haplotypes. If you don’t, a warning will appear reminding you to do this. Make sure you soft mask any primer binding sequences from the alignment. But note, don’t trim them off because you need nanopolish to have a bit of an alignment ‘edge’ in order to get calibrated on. You can reduce this to 10 or so with —min-flanking-sequence. The script align_trim from the ARTIC pipeline will do this with knowledge of your primal scheme supplied in BED format. The nanopolish output is a VCF file (not an updated consensus). Edit your reference using the VCF output, after filtring. I suggest filtering on the log-likelihood quality score - empirically around 200+ is good. Also you can filter on SupportFraction. I tend to filter out any indels in homopolymers although these will get a low likelihood score anyway most likely. All this (and more!) is implemented in the ARTIC pipeline, refer to: http://artic.network/ebov/ebov-it-setup.html and http://artic.network/ebov/ebov-bioinformatics-sop.html for more details. Oh finally - much heartache during analysis is saved by including a negative (water) control all the way through to assigning a barcode, and a positive control of known sequence. What if you could sequence E. coli in just one read? This was the challenge I set Josh. 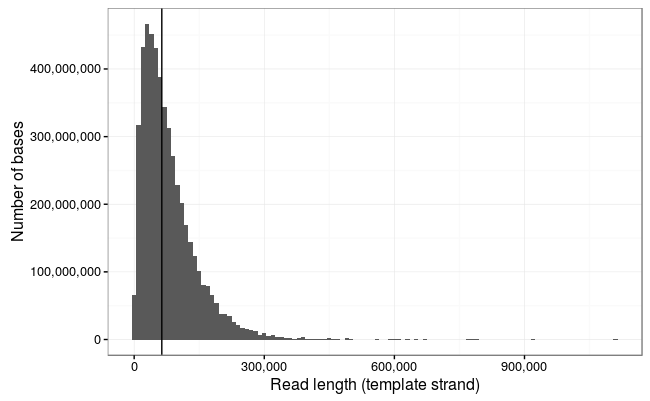 And why can’t we do that, if nanopore sequencing really has no read length limit? Well actually: we’re not quite there yet, but we did manage to sequence 1/6th of the whole genome in a single read last week. Here’s how we (well, he) did it. As usual we like to release our protocols openly and early to encourage the community to test and improve them. Please let us know about any tweaks you find helpful! The community seems very excited by this judging by my Twitter feed and email inbox, so we have rush released the protocol. The tweets have also inspired commentaries by Keith Robison and James Hadfield, thanks guys! First … a bit of background and the importance of working with moles not mass. This line of thinking was triggered during the Zika sequencing project when we noticed our yields when sequencing amplicons was never as good as with genomic DNA. Why was that? We decided a possible reason is that nanopore sequencing protocols are usually expressed in terms of starting mass (typically 1 microgram for the ligation protocols). But of course 1 microgram of 300 bp fragments is a lot more (>25x more) DNA fragments compared to 1 microgram of 8000 base fragments. By not factoring this in the library prep, likely we were not making an efficient library because the protocol has not been scaled up 25 times to account for this difference. 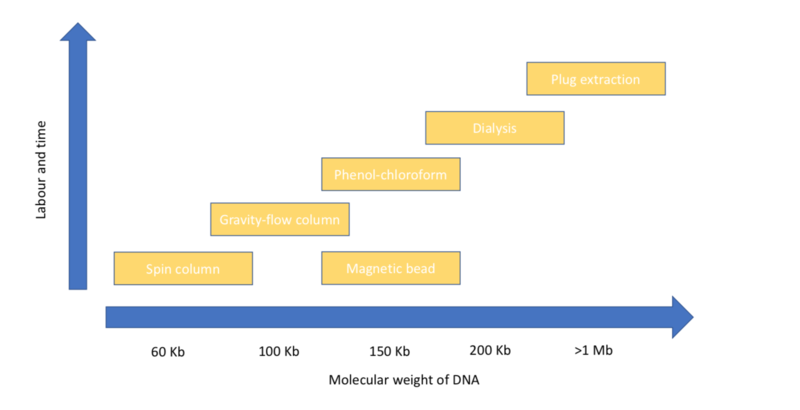 It stands to reason that it’s the molarity that’s important when loading the flowcell rather than the total volume of DNA. If you could load some imaginary molecule of DNA with mass 1000ng (bear with me), the chances of that interacting with the pore is still quite low. More molecules means more potential interactions with the pore, meaning more potential yield. We calculated the desired starting molarity as 0.2 pM based on the length assumptions in the ONT protocol (in practice you load about 40% less after losses from library construction). So by increasing the amount of barcodes and adaptors, as we do in our Zika protocol, we can compensate for this. That solves the short read problem, but we started thinking about how it would work in the other direction. What if you wanted to get the longest reads possible, what would this mean in mass? The rather silly idea was — if you wanted to get reads sufficiently long to cover a whole bacterial chromosome in a single read, what would the starting DNA concentration need to be? The math here is simple; you just need to scale the starting DNA by 500x. But this would mean starting with ~500ug of DNA into the library preparation! how do you deposit that much DNA into the flow cell? So - we slightly scaled down our ambitions and decided that it could be practical to scale up the protocol 10-fold, which could still result in average 80 kb reads, a significant improvement to the 8kb typically seen with the standard protocol. We’d already been using the Sambrook protocol (from the classic Molecular Cloning - over 173,000 citations!) for our human genome extractions, which reliably gives very high molecular weight DNA that can be recovered with a Shepherd’s crook fashioned from a glass rod). 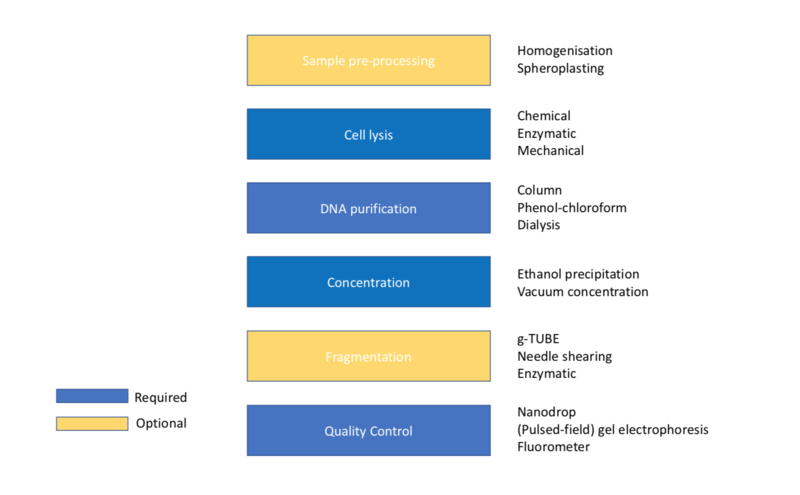 Previously Dominik Handler demonstrated that HMW extractions with careful pipetting could generate long reads with the rapid kit. So we did a new Sambrook extraction using an overnight culture of E. coli K-12 MG1655 and generated something that was very pure (260:280 of 2.0) and very high molecular weight (>60kb by TapeStation - the limit of the instrument). In fact the DNA is so long that you can’t really size it without employing a pulse-field gel electrophoresis setup. Sadly we don’t have a working one in the department, so infrequently are they used these days. So we were flying blind in terms of the true length of the fragments. The final piece of the puzzle was something we were aware of; the nanopore control software as of version 1.3 does periodic ‘global voltage flicks’ - meaning that the voltage is reversed across the flow cell every 10 minutes. The aim of this is to prevent strands or proteins blocking up the pores, by a rapid change of the direction of the ionic current. However, the problem with a 10 minute flicking interval is that it intrinsically limits the longest read on the system to 150kb (with 250 base/s chemistry) and 270kb (with 450 base/s chemistry). In MinKNOW 1.3 you could change the script parameters (stored in a YAML file) to remove this flick, but in MinKNOW 1.4 luckily it has been dispensed with entirely in favour of a much smarter system that dynamically unblocks individual pores on demand. So … how does it look after all that’s been done? We ran E. coli K-12 MG1655 on a standard FLO-MIN106 (R9.4) flowcell. Ewan Birney suggested this would be more interpretable as a log10 scale, and by golly he was right! But hold your horses. As Keith Robison likes to say, and Mark Akeson as well, it’s not a read unless it maps to a reference. Or as Sir Lord Alan Sugar might say, “squiggles are for vanity, basecalls are sanity, but alignments are reality”. Are these reads actually real, then? Just judging by the distribution it’s clear that this is not all spurious channel noise. This dataset poses a few challenges for aligners. BWA-MEM works, but is incredibly slow. It goes much faster if you split the read into 50kb chunks (e.g. with split.py) but this is a bit annoying. I decided to use GraphMap, this has a few useful functions - it will try to make an end-to-end alignment and it also has a circular alignment mode, which is useful as we would expect many of these reads would cross the origin of replication at position 0. Another problem! The SAM format will not convert to BAM successfully, so I’ve output using the BLAST -m5 format for ease of parsing. The SAM/BAM developers are working on this (CRAM is fine). So we lose a few of the really long reads here which are obviously noise (the 1Mb reads is just repetitive sequence and probably represents something stuck in a pore and the 900Kb read is not a full-length alignment), but otherwise there is an excellent correlation between the reads and alignments. That’s theoretical 1x coverage of the 4.6Mb chromosome of E. coli in just the 7 longest reads !! 95.47% of the bases in the dataset map to the reference, and the mean alignment length is slightly higher at 34.7kb. The 790kb read that didn’t align full-length is interesting. On inspection it is actually two reads - the template and complement strand of the same starting molecule, separated by an open pore signal. This gives us a clue as to how the proposed 1D^2 technology (which is replacing 2D reads) could work. Calling the two reads together (thanks, Chris Wright) gives a 95% accuracy read! We’ve started using the Albacore basecaller for this, rather than uploading to Metrichor. Albacore seems to keep up with basecalling a live-run when using 60 cores. So we would like to claim at least four world records here! 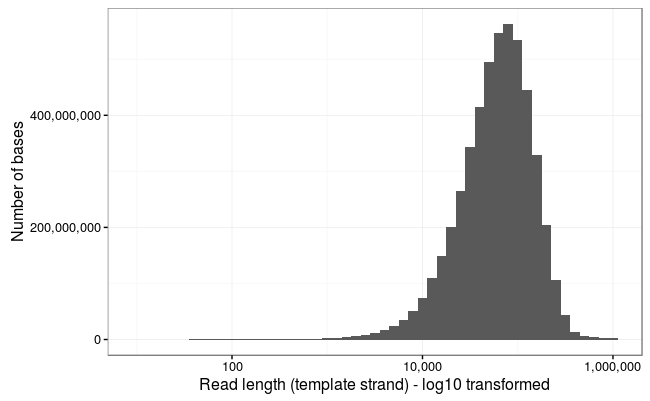 An interesting exercise for the reader is to figure out the minimum number of reads that can be taken from this dataset to produce a contiguous E. coli assembly! My first attempt found a set of 43 reads which covers 92% of the genome, but you can do better! Where now? Well, readers will notice that a real landmark is in sight - the first megabase read. We’ve been running this protocol for a bit over a week and a new hobby is ‘whale spotting’ for the largest reads we can see. We haven’t quite yet worked out a systematic naming scheme for whales, but perhaps Google has the answer. So in that case, we’ve in the past few days hit our first narwhal (an 882kb read from a different run, which translates to a 950kb fragment judged against the reference). How can we go longer? 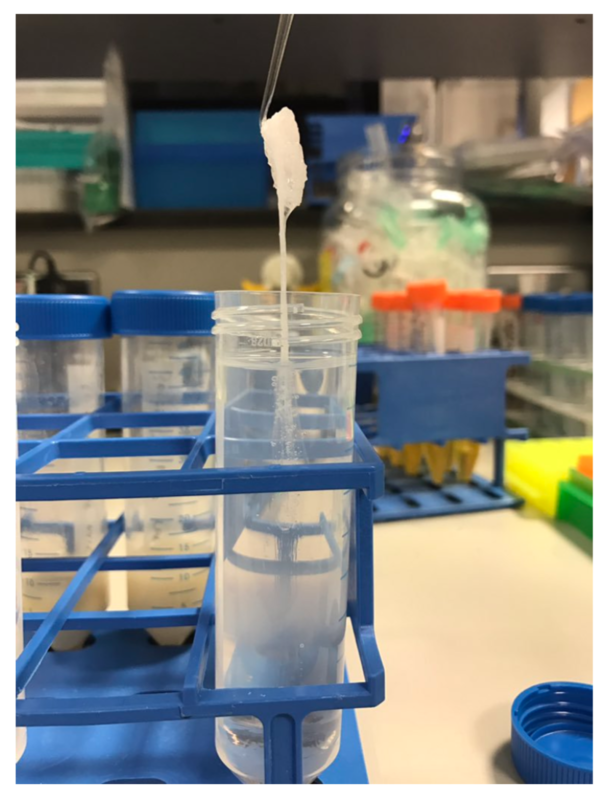 Well it might be possible to increase the DNA input some more, but we start hitting issues with the viscosity which may start to prevent pipetting onto the flowcell. Also pipette shearing forces are presumably an issue at these concentrations. The general consensus is that we will need to employ solid-phase DNA extractions and library construction, e.g. in agarose plugs. The SageHLS instrument also looks quite interesting. The nanopore squad, John Tyson and Matt Loose provided much helpful advice and input during the development of this protocol. 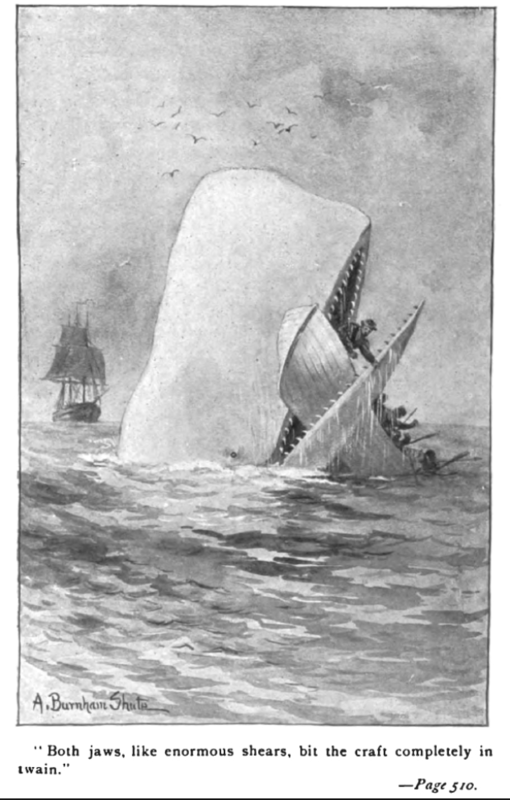 Matt Loose came up with the whale naming scheme. Thanks to ONT for technical support with particular thanks to Clive Brown, Chris Wright, David Stoddart and Graham Hall for advice and information. I have received an honorarium to speak at an Oxford Nanopore meeting, and travel and accommodation to attend London Calling 2015 and 2016. I have ongoing research collaborations with ONT although I am not financially compensated for this and hold no stocks, shares or options. ONT have supplied free-of-charge reagents as part of the MinION Access Programme and also generously supported our infectious disease surveillance projects with reagents. Q: Take 10 samples at random and look at their taxonomic distribution. Tabulate the top 3 phyla present and their relative abundances. Q. Pick some samples at random. For example sample, look at the taxonomic distributions. Q. Do any samples look abnormal, compared to the ‘normal’ microbiome? Q. Are any toxins present? Which ones? What is the significance of this toxin and how might it cause disease? Q. What antibiotics might the outbreak strain be resistant to? Q. How could we prove that the outbreak strain is resistant to these antibiotics? Q. What did the study set out to find? Q. How did they sample their environment? How many samples did they look at? Q. How does this environment compare taxonomically with the human gut? Is it more or less diverse? Are the set of organisms present similar or different? Q. How does this environment compare functionally with the human gut? Can you explain these findings in the context of the environment? In this practical we will analyse datasets from several studies, some very important, others perhaps just a little silly. The Human Microbiome in Space and Time. CSI: Microbiome. Can you determine who has been using a keyboard from the microbiome that is left behind? Do keyboards have a core microbiome?? Development of the infant gut microbiome. Q: What is the difference between alpha- and beta-diversity? Let’s have a look at the results. Q: Is there evidence of natural clusters being formed? Q: Do samples cluster by individual? If not, how do they cluster? Q: What are the most dominant taxa in stool, skin, urine? Look at different taxonomic levels down to genus. Q: Are these sites similar or different? What are the major differences in taxonomic profile between these three sites? Q: Skim read the introduction of the paper to get a feel for what they are trying to find out. Hint: M1, M2 and M9 are the three participants referred to in the paper. Q: What are the most abundant taxa? Q: Go back to the taxa barplots, can you figure out which taxa are driving the variation producing grouping? Q: Which of these taxa are part of the normal skin microbiome? Are any out of plcae? Where might they come from? Q: Do you think this technique will really be usable for forensics? What are the challenges? What other techniques might work better for studying the microbiome? Q: Now, read the paper in more detail and prepare a short summary to present the context for the study, the methods employed and the results found. Q: What surfaces have the greatest amount of diversity? Is this expected? Q: What do the profiles of stool, etc. look like? Q: Are there any natural looking clusters in the data? Q: Which sources of samples are most similar to others? Q: Is there any clustering between different floors of the building? Q: Compare the weighted vs unweighted Unifrac results, do the clusters look more natural in one or the toher? Q: Which surfaces have the most diversity? Least? Q: Now, read the paper in more detail and prepare a short summary to present to the whole group. Consider: the context for the study, the methods that were employed and the results found. What did you think? What are the limitations of the study? Q: How do the taxa change over time? Q: Which infant samples do the maternal stool most look like? Q: Is the colour of stools associated with their bacterial diversity?